Then analysis of the operation of modern multi-bearing sprinkling machines has shown that for irrigation needs and movement of sprinkling technics when in use for watering different types of drives and energy sources are used, in particular diesel fuel and electrical power. Most sprinkling machines move whren irrigating with the help of electric motors of self-propelled carts, which are supplied by power generators of low power (up to 20 kW), which are driven by a diesel engine, and water to the car is fed from a stationary electrified pumping station. There is an option for moving sprinkling machines with the help of hydraulic motors mounted on the carts, which are driven by hydraulic fluid supplied to them by a hydraulic pump from a diesel engine drive. As the electrified pumping stations of irrigation systems were designed for the pressure of 0.6 … 0.8 MPa at the point of connection of a sprinkling machine, while today the sprinkling machines operate at pressure of 0.3 … 0.4 MPa, that is, there is a possibility of using the so-called excess pressure of 0.2 … 0,3 MPa for obtaining some additional energy at the place of connection of a sprinkling machine without redesigning and laying additional pipelines or power transmission lines. It is important to direct this extra energy for moving sprinkling machines. The purpose of the research is to develop the circuits of hybrid drives with the use of alternative energy sources to reduce fuel consumption for irrigation by circular, frontal and frontal-circular sprinkling machines. Analysis of previous research. In the course of previous research at the Institute of Water Problems and Land Reclamation of NAAS it has been established the possibility of using a full-flow hydro turbine as an energy source to feed the drives of the support carts of a multifunctional sprinkling electrified circular machines. The use of a full-flow hydro turbine, powered by the energy of irrigation water flow, makes it possible to do without a diesel generator, and thus without the fuel burn for its operation. Along with that, the sprinkling machines, whose power is provided only by the energy of irrigation water flow (from the irrigation pipeline), cannot move without performing watering. This is a disadvantage that prevents the implementation of technological regulations for watering by such types of sprinkling machines. Research results. The results of the calculations of the power required for the movement of circular sprinkling machines of various modifications have shown that the use of excess energy of irrigation water in the pipeline at the input of a sprinkling machine with a hydroturbine drive, as a power source for the electric drive or the hydraulic drive for the movement of support carts, requires an increase in pressure in the irrigation network up to 4 m, and taking into account the possible losses of pressure at the connection points and in view of providing a water energy reserve the increase in pressure should be up to 10 m. In this case, the turbine drive with water consumption from 50 to 100 l / s can provide a power within the range of 4.0 to 8.0 kW. Based on the results of the calculations, we obtained the initial data for the development of the circuits of hybrid drives of sprinkling machines at existing irrigation systems using alternative energy sources. Also we proposed different circuits of hybrid drives of carts, which can be applied on modern multi-support sprinkling machines. Conclusions. 1. It has been established that modern sprinkling machines operate at a pressure of 0.3-0.4 MPa, while the existing electrified pump stations are designed for pressure in a closed irrigation network of 0.6-0.8 MPa, which gives the possibility of obtaining additional energy for moving sprinkling machines by means of a hybrid drive. 2. It has been established that a hybrid drive with a flow rate from 50 to 100 l/s can provide a capacity within 4.0-8.0 kW. 3. The turbine capacity for moving a sprinkling machine in length from 200 to 500 m, which should be up to 10 kW, has been grounded. 4. It has been obtained the initial data for the development of circuits of hybrid drives of sprinkling machine at the existing irrigation systems using alternative sources of energy. The flow rate of a sprinkling machine should not be less than 50 l/s and the minimum pressure at the connection point of a sprinkling machine should be 0.48 MPa. 5. The circuits of the hybrid drives of sprinkling machine carts with the use of a full-flow turbine have been developed, which will enable to increase the efficiency of existing irrigation systems by providing the excess energy of water pressure in the pipeline network of existing irrigation systems, as well as to provide energy and material resources savings in the range of 20-30%. 1. Mashyny і obladnannya dlya zroshuvannya. Posіbnyk. / Kolektyv avtorіv. Za red. V.І. Kravchuka. Mіnіsterstvo agrarnoyi polіtyky ta prodovolstva Ukrayiny; UkrNDІPVT іm. L. Pogorіlogo. Doslіdnycke. 2011. 112 s.
2. Gryn Yu.І., Muzyka O.P., Antonyuk A.V. Energoefektyvnіst vykorystannya suchasnyh shyrokozahvatnyh doschuvalnyh mashyn // Mehanіzacіya ta elektryfіkacіya sіlskogo gospodarstva. Glevaha, 2011. Vyp. 95. S.427-434. 3. Gryn Yu.І., Muzyka O.P., Antonyuk A.O. Tehnіko-ekonomіchnі ta agrotehnіchnі parametry suchasnyh doschuvalnyh mashyn // Mehanіzacіya ta elektryfіkacіya sіlskogo gospodarstva. Glevaha, 2013. Vyp. 97. Tom 1. S.248-257. 4. Gryn Yu.І., Velbіk A.G., Antonyuk A.V. Analіz energoefektyvnostі suchasnyh bagatoopornyh doschuvalnyh mashyn // Melіoracіya і vodne gospodarstvo. 2013. Vyp. 100. T.1. S. 198-211. 5. Yu.І.Gryn, A.G.Velbіk, A.V.Antonyuk Energetychna і ekonomіchna efektyvnіst zastosuvannya gіdroturbіnnogo pryvoda dlya doschuvalnyh mashyn krugovoyi dіyi // Vіsnyk Harkіvskogo nacіonalnogo tehnіchnogo unіversytetu sіlskogo gospodarstva іm. Petra Vasylenka. Harkіv: 2014. Vyp. 151. S.134-140. 6. Gryn Yu.Y., Muzyka O.P., Antonyuk A.V. Effektyvnost prymenenyya mnogoopornyh dozhdevalnyh mashyn v Ukrayne // Systema tehnologyy y mashyn dlya ynnovacyonnogo razvytyya APK Rossyy. Mezhdunar. Nauch.-tehn. konf. : sb. nauchn. dokl. Moskva: 2013. S. 255-260. 7. Antonyuk A.V. Doslіdzhennya gіdroturbіnnogo pryvoda doschuvalnoyi mashyny krugovoyi dіyi // Melіoracіya і vodne gospodarstvo. 2014. Vyp.101. S.351-359. 8. 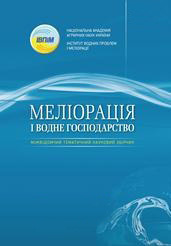 Romaschenko M.Y., Muzyka A.P., Voytovych Y.V., Martynyuk G.F. Tehnyko-tehnologycheskoe obespechenye vodohozyaystvenno-melyoratyvnogo kompleksa Ukrayny // Ynnovacyonnoe razvytye APK Rossyy na baze yntellektualnyh mashynnyh tehnologyy. Mezhdunar. nauch.-tehn. konf. Vseroscyyskyy nauchno-yssledovatelskyy ynstytut mehanyzacyy selskogo hazyaystva. : sb. nauch. dokl. Moskva: 2014. S.232-235. 9. Gryn Yu.І., Dem'yanyuk O.S. Doslіdzhennya tehnіko-ekonomіnyh pokaznykіv doschuvalnyh mashyn frontalnoyi dіyi // Melіoracіya і vodne gospodarstvo. 2003. Vyp. 89. S. 194-200. 10. Gryn Yu.Y., Kondrashova N.V. Raschet konstruktyvnyh parametrov dozhdevalnyh mashyn // Melyoracyya y vodnoe hozyaystvo. 1992. Vyp. 77. S- 63-69.